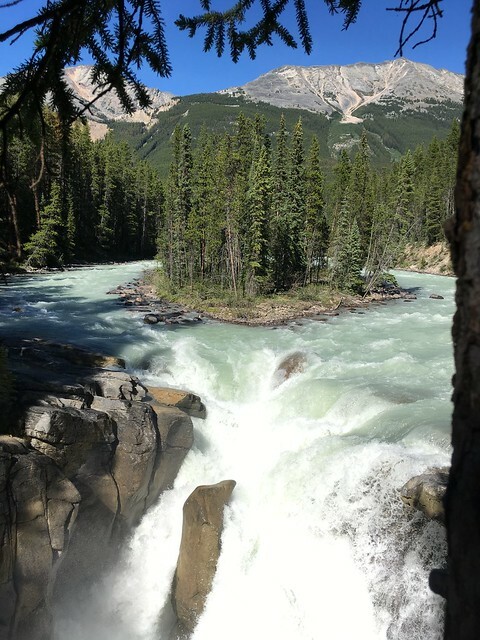 Icefields Parkway 2 | What Goes With What? 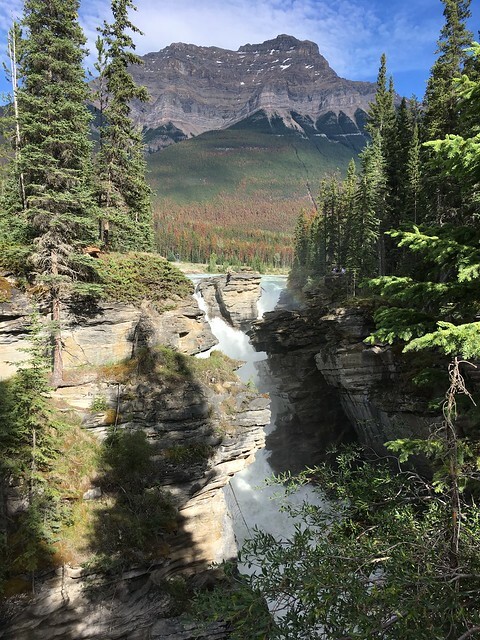 Today we made our way back down the Icefields Parkway. 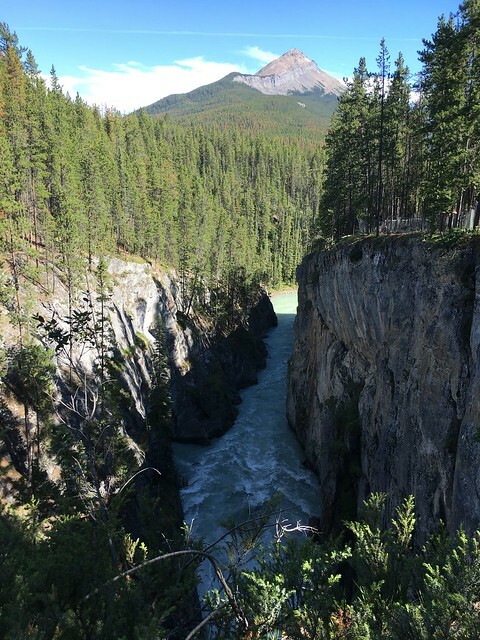 In getting to Jasper we skipped several sights along the way. 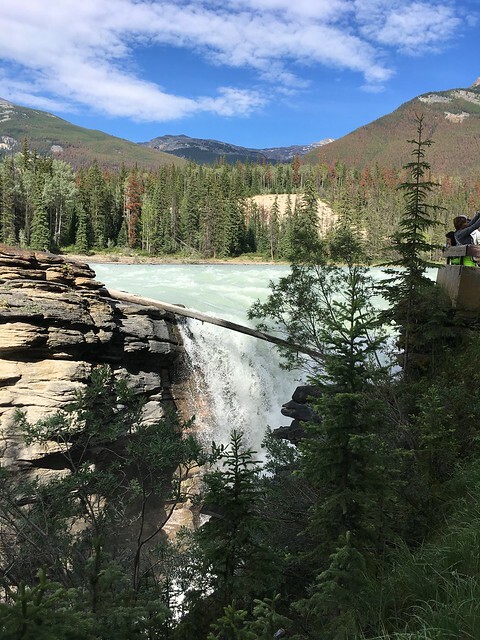 Our goal today is to see the Columbia Icefields glaciers and waterfalls along the Icefields Parkway. The Viking and I have very mixed feelings about seeing the glaciers in a respectful way. There is a lot of commercialism in this section of the Icefields. At the Glacier Skywalk you can walk on a glass outlook with an amazing view of the valley but you can’t even see the glacier from this location. From the Discovery Center the big Ice Explorer busses take people out onto the glacier. Both cost a pretty penny! 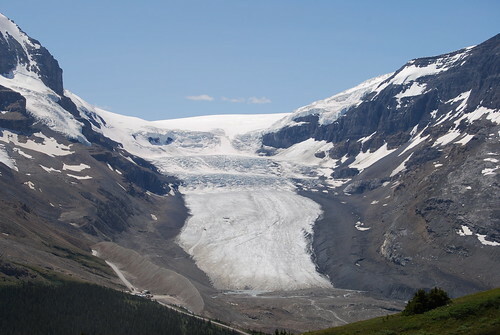 We did visit Columbia Icefields Glacier Discovery Center where we learned about the receding Athabaska Glacier. Looking across the valley to the glacier you see a road cut into the glacier with many diesel powered Ice Explorer busses driving onto the glacier itself. All the emissions cannot be good for the glacier. Those busses are loud and putting out exhaust directly onto the glacier with their big diesel engines running. How many busses drive on the glacier each day? 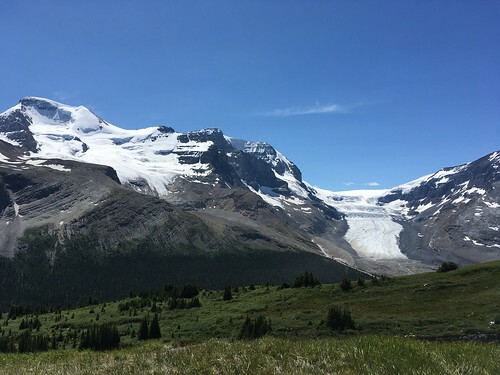 A local business owner in Jasper told us about hiking up to the toe of the glacier but the diesel fumes flow down the glacier to the Valley which ruined the experience for her. End Rant here!! 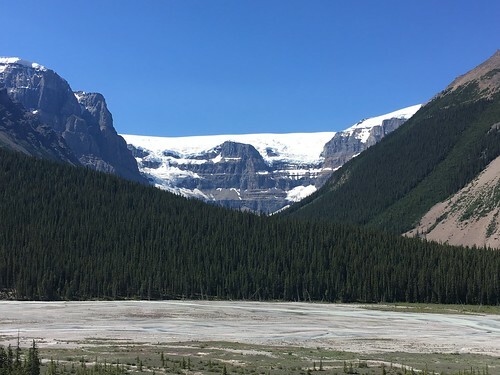 The Viking and I opted for a hike to view the Athabasca Glacier from the other side of the valley. 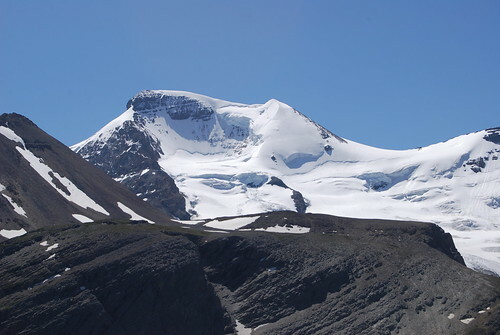 Wilcox Pass is directly above the Columbia Glacier Center. 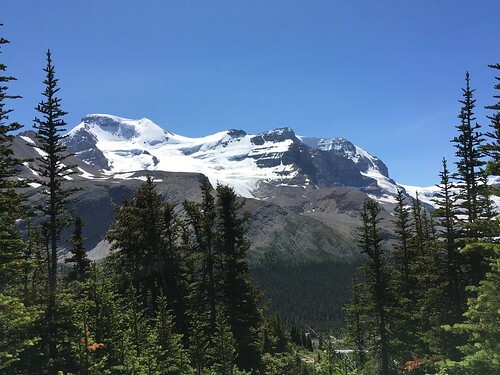 The hike takes you thru the woods and above the tree line where the view of the glacier across the valley is spectacular. I must say that this hike was hard for me. My house is basically at sea level so hiking at this altitude made it hard to breath. The elevation gain was significant for most of the hike. Once above the tree line the trail levels off to a gentle slope which was very nice. The views… There are no words. 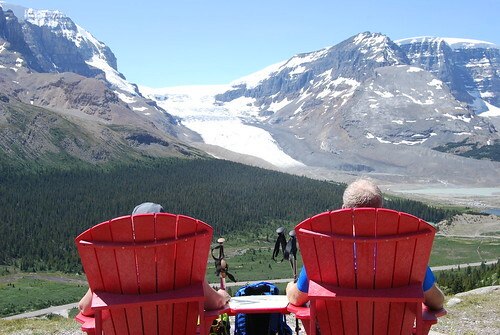 Here we sat in the red chairs for a bit enjoying the view and catching our breath before we hiked further. The road below us is level with where we started our hike. The view was better and better the higher we hiked. Eric calculated our elevation at about 7500 feet when we finally turned around. 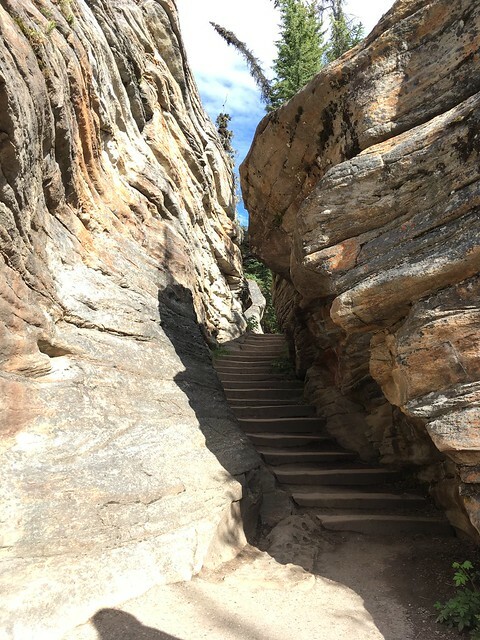 An easy walk to the viewing bridge. Thank God! Still recovering from our hike. 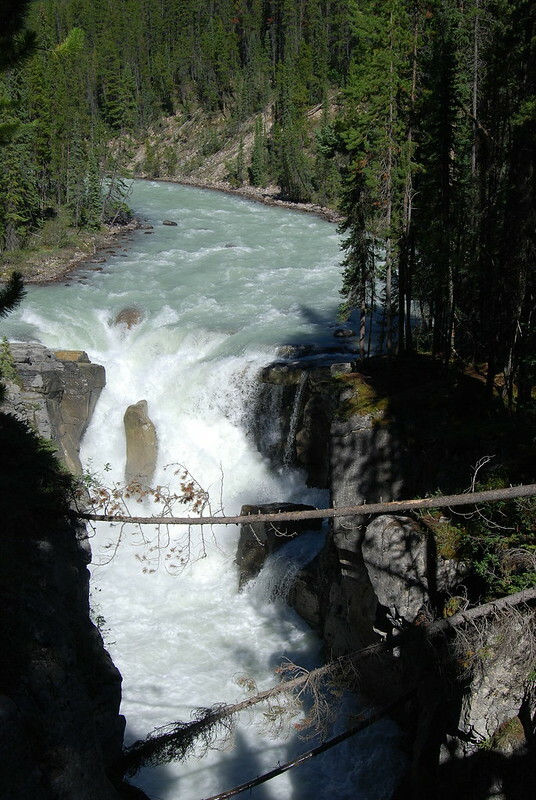 The river flows around a small island before it drops into the falls. 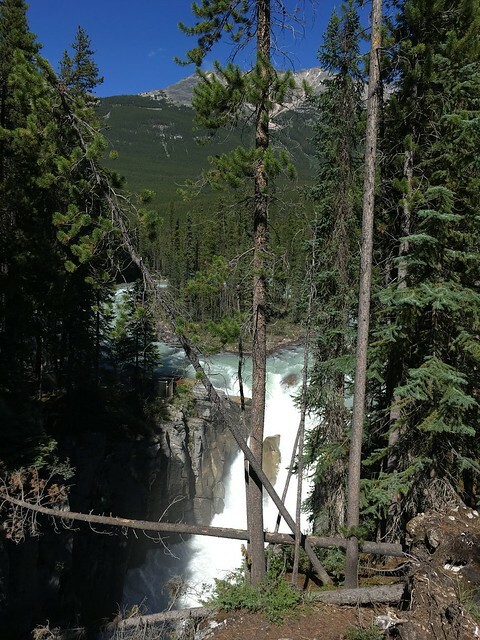 There is a viewing platform to the left of the falls but the image I had seen online was a little more challenging to get on camera. To the right of the falls right on the rocks that’s the spot to get the best photo. I was tired from the hike but it was so worth it. Just a short scramble down the bank and across to the rocky cliff. 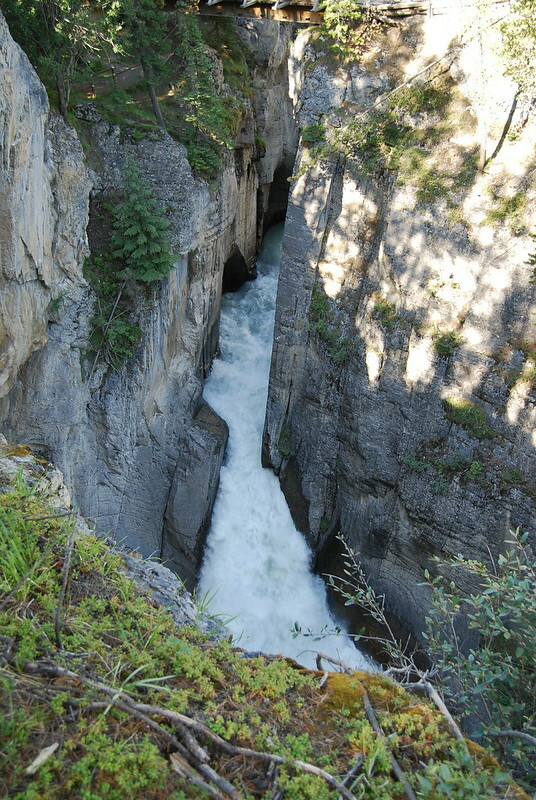 Another must see waterfall. 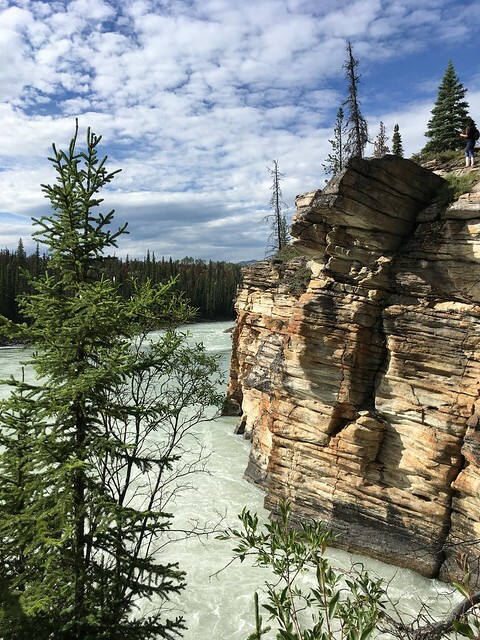 Athabasca Falls is an easy walk to several view points with bridges and stairs to different viewing areas. 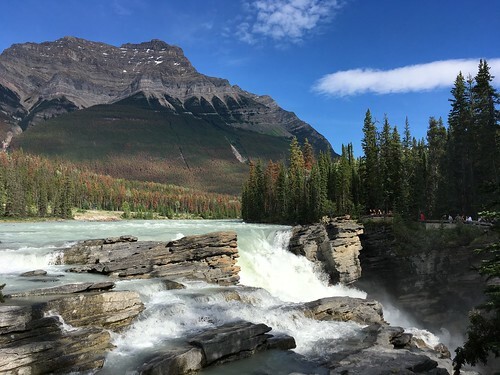 This entry was posted in Adventure and tagged Adventure, Athabasca Falls, Athabasca Glacier, Columbia Icefields, Icefields Parkway, jasper, road trip, Sunwapta Falls by Diana. Bookmark the permalink.